I love the look and texture of these corkscrew pasta pieces! There is a lot of healthy stuff in this bowlful – mushrooms, onions, garlic, carrots, celery, and a whole bag of a dark greens salad mix. The couple of ounces of chicken are leftover from last night and the sauce is some chicken stock and leftover packet gravy. 2017 healthy dinner number three! 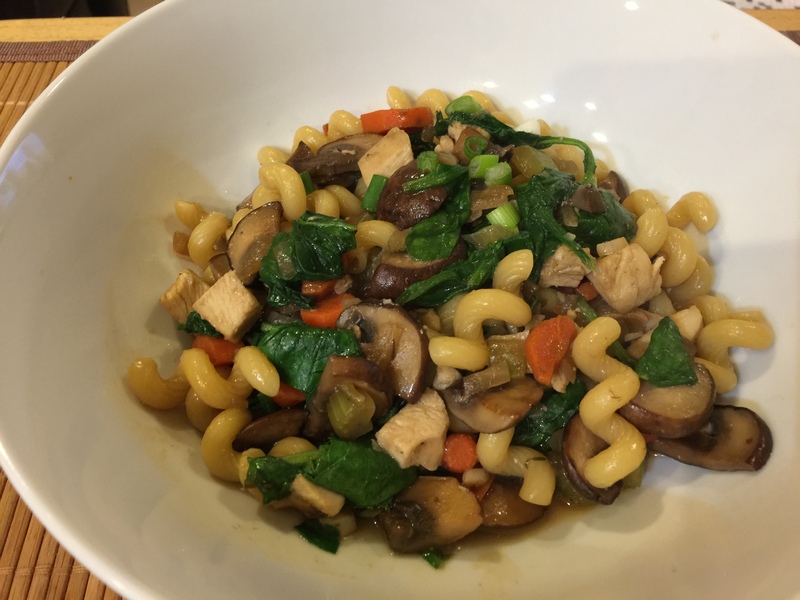 This entry was posted in leftovers, Pasta, Poultry, Vegetables and tagged carrots, Celery, chicken, garlic, healthy lifestyle, leftovers, mushrooms, Onions, pasta, Vegetables. Bookmark the permalink.